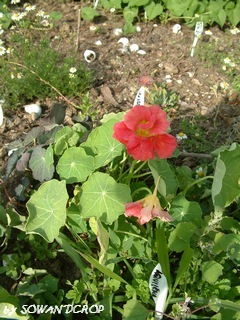 Tropaeolum majus is a pernnial plant in its native country (Perù). Here it is considered an annual one because of cold winter. It has therapeutic functions as antibiotic and anti-scurvy thanks to its huge amount of vitC. Its leaves and flowers are edible, and its flavour is similar to cress thanks to sulphur components. Categorie: Curiosità, Erbacee, Giardino per i nostri amici, Orto, Rimedi naturali | Tag: nasturtium, nasturzio, Tropaeolum majus, tropeolo | Permalink.